Statement from 64 civil society organisations and coalitions ahead of the second meeting of the Fair Pricing Forum, hosted by the World Health Organization and South African government April 11-13th in Johannesburg. The Fair Pricing Forum will ask what is a fair price for a medicine? We accept that different stakeholders will have different understandings of what is ‘fair’ but the WHO’s current definition of a fair price is concerning. At a minimum, a definition of fairness must prioritize affordability and transparency of Research and Development (R&D) outlays, manufacturing costs, and pricing decisions. The issue of excessive medicine prices is global, inextricably linked to a lack of pro-patient medical innovation and affects all diseases, all technologies, and all countries, especially low and middle-income countries. 100 million people around the world each year are being pushed into poverty because of healthcare expenses. High prices cause avoidable human suffering, inequality and poverty. It is notable that this meeting is taking place in South Africa. Hundreds of thousands of people died from AIDS in South Africa because they could not afford excessively priced antiretroviral medicines in the late 90s and early 2000s. Today, many medicines, particularly cancer treatments, are unavailable to the majority of the South African population due to the high price, despite being available for a fraction of the price in other countries. This is partially because South Africa’s industry-friendly patent laws impede the introduction of low-cost generics, but also because there is no effective price regulation capping launch prices in the country. A medicine price cannot be considered fair if people or the government cannot afford it. This would compromise human rights including the right to life, the right to enjoy the benefits of scientific progress and its applications and the right to health. Currently the excessive prices of many cancer drugs results in people either dying because they cannot access the medicines or spending their life savings on co-payments for these medicines. We do not accept that this is fair. A medicine price cannot be considered fair without full transparency of all R&D expenditure, of manufacturing costs, and of how the price is decided. Transparency is required throughout the R&D process from the start of basic research to the final delivery of medical products to patients. Some governments and most pharmaceutical corporations try to justify high prices by citing the need to recoup R&D outlays. Yet, pharmaceutical companies refuse to provide details of these R&D outlays and of related support from public and charitable entities. Some governments and pharmaceutical companies are actively opposing various efforts at enforcing greater transparency (as per various bills in the United States and a transparency proposal from the Italian government to be considered at the World Health Assembly). Transparency is essential so that governments or other payers negotiating with pharmaceutical companies can have an informed understanding of the real investments made by the public and private sector in their various forms (including in-kind contributions from health institutions involving patients, doctors and infrastructure). We are concerned about the WHO’s current definition of a fair price that appears in the WHO’s Roadmap for Access to Medicines, vaccines and other health products (EB 144/17); a “Fair price is one that is affordable for health systems and patients and that at the same time provides sufficient market incentive for industry to invest in innovation.”. We are not aware of any formal process that led to the adoption of this definition, nor of the status of the definition. It does not require transparency of R&D costs and price setting decisions. This means that the public will still have to trust pharmaceutical companies’ price-setting. It does not account for the substantial role of the public sector in funding R&D. This must be considered in defining fair prices to ensure the public does not pay twice and receives a public return on public investments. It pre-supposes that R&D is always to be paid for through end prices of medicines. The definition thus excludes development models based on the principles of delinkage, in which R&D would be incentivized through grants, subsidies and innovation inducement prizes, rather than monopoly-based high prices. 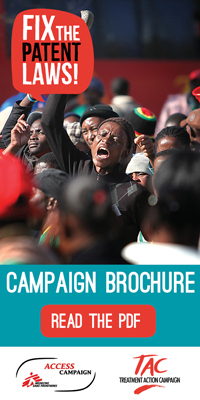 The Fix the Patent Laws campaign consists of 42 South African civil society organisations, including the Treatment Action Campaign, SECTION27, Doctors without Borders (MSF), and various mental health, NCD, sexual and reproductive health, and cancer organisations including those that make up the Cancer Alliance. We have so much respect for intellectual property in South Africa that at present we grant patents without examining whether the patents are merited. Government has finally started a process to institute a patent examination system, but this will take time to get off the ground. For now, we continue to give away patents without scrutiny. A recent report released by the Fix the Patent Laws campaign and the Cancer Alliance exposed the excessive patenting of cancer medicines. 92 secondary patents were found on just 24 cancer medicines in South Africa, 39 of which had been rejected or withdrawn in at least one other country. This impacts on both affordability and availability in the country. 15 out of the 24 medicines were found to be available in India for half the price than South Africa – and in some far less. In the most extreme case, a year’s supply of lenalidomide is priced at ZAR 882,000 in South Africa and less than ZAR 32,000 in India. These high prices mean that out of the 24 medicines, only 7 are available in the public sector. This excessive respect for intellectual property has real-world consequences for normal people like Sue Johnson and Tobeka Daki, leaders in our campaign who passed away without access to certain lifesaving cancer medicines. South Africa has also never issued a compulsory license on a medicine, not even at the height of the AIDS epidemic in the mid-2000s, despite the fact that we could legally have done so under World Trade Organisation (WTO) rules. With Cabinet’s recent adoption of Phase I of the National Intellectual Property Policy, there is finally reason to hope that government will find a better balance between respect for human life and the private interests of pharmaceutical companies. Finding this better and more humane balance within the framework of current WTO rules is possible, as has been shown in countries like India and Argentina. In practical terms this better balance involves: Introducing a patent examination system, raising the bar for what deserves a patent to ensure only true inventions are rewarded, introducing more workable compulsory licensing procedures, and providing simple procedures for any interested party to challenge the grant of a patent. South Africa urgently needs to reform its Patents Act to introduce these changes. We urge the South African government, and all other governments, to place respect for human life and the right to healthcare services ahead of the WIPO agenda that prioritises the enforcement of IP held by multinational companies. This is in line with the rights and obligations enshrined in our Constitution, which requires the state to respect, protect, promote and fulfil the Bill of Rights. It is also in line with common human decency. The Fix the Patent Laws Coalition is a coalition of 40 patient groups and civil society organisations representing most major diseases areas in South Africa. The coalition was founded in 2011 by the Treatment Action Campaign (TAC), SECTION27 and Doctors without Borders (MSF). We advocate for reform to South Africa’s patent laws that will ensure wider and more affordable access to medicines. JOHANNESBURG, 31 MAY 2018 – Yesterday, after nine years of development, the Department of Trade and Industry (the dti) finally published the Intellectual Property Policy of the Republic of South Africa, Phase I. The policy has been adopted by cabinet and as such represents official government policy, and has the potential to herald a new era in access to medicines for South Africa. While we welcome the finalisation and adoption of this policy, we stress that it has not yet changed anything in the lives of people in South Africa who right now need medicines that remain unaffordable, and that it will not do so until key elements of the policy become law. As a matter of urgency, the dti must produce a thorough and far-reaching bill to amend the relevant Acts and parliament must prioritise the passing of this bill. Those aspects of the policy that can be implemented without legislative changes must be implemented right away. Whether the state can deliver the required legislative changes will be a key test of its commitment to the health of the people. The harsh reality is that this law reform process in South Africa has already taken too long. It has taken too long for two of our comrades who have passed away in recent years, Tobeka Daki and Sue Johnson. At critical times in their illnesses, both Tobeka and Sue could not access the medicines they needed due to high prices. We will remember these comrades as we continue to advocate for more just and humane patent laws. As the Fix the Patent Laws coalition, we welcome the publication of the new policy and we are broadly in agreement with its content. The policy addresses most of the critical health-related policy and legislative changes that we have been campaigning for since 2011. We are disappointed though that certain critical sections of the policy are lacking in detail – in particular the sections on patentability criteria and on compulsory licensing. That said, we welcome the policy’s framing in terms of the Constitution of South Africa and its acknowledgement of the importance of considering the public health impact of economic policy. We also welcome the policy’s acknowledgement that South Africa requires an intellectual property framework appropriate to its phase of development and that a patent maximalist approach is not in the best interest of our economy. In this regard, the policy implicitly rejects the incorrect view that trade-offs have to be made between the right to health and economic development. We support the introduction of a substantive patent search and examination system for patents in South Africa – something we have been advocating for, for years. The policy recognises that the current depositary system, in which patent applications are granted if they meet procedural formalities (paperwork and filing fee), leads to an excessive number of poor quality patents being granted in comparison to other countries. Patent examination guidelines must now be published for public input and the examination of patent applications for pharmaceutical products must start as soon as possible. We welcome the commitment to develop patentability criteria to “promote genuine innovation” – although we are disappointed that the policy does not go further to discourage specific evergreening practices. Ideally, the policy would have explicitly stated that South Africa will no longer grant patents for new uses, new forms, new formulations, combinations and other minor modifications of existing medicines. To improve the system, it is vital that South Africa develop rigorous patentability criteria and examination guidelines, following international best practices in countries of a similar developmental status, such as Argentina and India. By ensuring that only patents that meet rigorous criteria for novelty and inventiveness are granted, the government can curb excessive and secondary patenting, and ensure that only genuine innovation is rewarded. This will facilitate earlier introduction of more affordable generic medicines, ensuring that more people can access medicines earlier. Raising the bar for patentability is also necessary to incentivise R&D expenditure and efforts towards the development of meaningful health innovations that address unmet health needs, rather than perpetuating the pursuit of minor modifications and me-too versions of existing profitable products. We welcome the long-term commitment to introducing pre- and post-grant patent opposition procedures that could help ensure that only those inventions that represent genuine innovation are granted patent protection. This has been another key ask of our campaign. However, we are concerned that the interim solution proposed by the policy—a third-party observation system and administrative law procedures—will not permit sufficient participation by third-parties. We instead encourage the rapid introduction of simplified opposition procedures, and greater transparency concerning patent applications to allow third parties, such as civil society groups and other pharmaceutical companies, to intervene. We support the commitment to introduce a “more effective and efficient” system to obtain compulsory licenses for medicines – another key ask of our campaign in recent years. Compulsory licenses are a vital tool to ensure medicine access and must be available on a wide variety of grounds and in such a way that they can be granted quickly and effectively when needed for public health purposes. We urge government to withstand the industry pressure that will no doubt oppose this policy commitment, even though this commitment is entirely in line with World Trade Organisation rules. We remain committed to engaging constructively with the DTI, the inter-ministerial committee on IP, and wider government to ensure rapid reforms to our patent laws to improve access to medicines in line with the state’s Constitutional obligations. We cannot wait another nine years for this policy to be turned into law. The policy references the Fix the Patent Laws report that outlines key medicines that people have struggled to access as a result of patent barriers in South Africa: “Patent Barriers to Medicine Access in South Africa: A Case for Patent Law Reform”. The Fix the Patent Laws Coalition, made up of 40 patient groups and civil society organisations representing most major diseases in South Africa was launched on 11 November 2011 (on the 10-year anniversary of the WTO Doha Declaration) to advocate for changes to South Africa’s Patent Laws. Members include: Treatment Action Campaign (TAC), Doctors Without Borders (MSF), SECTION27, the South African Non-Communicable Diseases Alliance (SANCD Alliance), DiabetesSA, EpilepsySA, Marie Stopes South Africa, Stop Stock Outs Project (SSP), South African Depression and Anxiety Group (SADAG), Cape Mental Health (CMH), the South African Federation of Mental Health (SAFMH), Schizophrenia and Bipolar Disorders Alliance (SABDA), as well as the following members of the Cancer Alliance and Advocates for Breast Cancer: Breast Course 4 Nurses, Breast Health Foundation, Cancer Association of South Africa (CANSA), Cancer Heroes, Can-Sir, CanSurvive, Care for Cancer Foundation, Childhood Cancer Foundation of South Africa (CHOC), Hospice Palliative Care Association (HPCA), Igazi Foundation, Look Good Feel Better, Love your Nuts, Lymphoedema Association of South Africa (LAOSA), Men’s Foundation, National Council Against Smoking, National Oncology Nursing Association of SA, Pancreatic Cancer Network of SA (PanCan), People Living With Cancer (PLWC), Pink Trees for Pauline, Pink Phoenix Cancer Foundation, Pocket Cancer Support, Project Flamingo, Rainbows and Smiles, Reach for Recovery, South African Oncology Social Work Forum (SAOSWF), The Pink Parasol Project, The Sunflower Fund, Vrede Foundation and Wings of Hope. The Fix the Patent Laws Coalition (FTPL) welcomes the news today that the Cabinet of the Government of South Africa has approved the new Intellectual Property (IP) Policy. After nine years of policy development, two different draft policies and various rounds of public consultation, we now finally have an agreed-upon government policy that can guide much-needed law reform. Though we await seeing the final policy until it is gazetted by government, we are optimistic that the policy will herald a new era for access to medicines in South Africa by prioritising people’ lives over the profits of pharmaceutical corporations. While the finalisation and adoption of a policy is an important milestone, the hard work of developing and passing legislative amendments is still ahead of us. We urge the Department of Trade and Industry to prioritise the development of bills that will bring a more humane and Constitutionally sound balance to our legal framework. The approval of the new IP policy is particularly poignant given that it comes just days after the loss of one of our members and brave patient activists, Sue Johnson, on 16 May 2018, to Multiple Myeloma, for which she was unable to access the recommended treatment (a medicine called lenalidomide) due to its exhorbitant cost of R75,000 per month. This same medicine is available in India for just R5,000 per month. We remember at this time also our dear colleague Tobeka Daki, who passed away in November 2016 from HER2+ Breast Cancer, and who too was unable to afford the medicine she needed – trastuzumab, which cost approximately R500,000 per course at the time. We salute these brave comrades and the many others who have not been able to get the medicines they needed as a result of South Africa’s regressive patent system. Though we celebrate today as an important step in the right direction, we will continue the fight to fix South Africa’s patent laws until all who need affordable medicines can access them. We remain committed to a world where no-one is denied life-saving or suffering preventing treatment simply because they cannot afford it. FTPL will release a full statement after having read and analysed the new policy in detail. It is with immense sadness that the Fix the Patent Laws (FTPL) Coalition shares the news of the passing of a dear friend and brave patient advocate, Sue Johnson. Sue was a mother of two children and grandmother to two girls. She was born in the UK and moved to South Africa in 1983, where she spent her life working for the UN and Habitat for Humanity in Cape Town until her retirement in 2017. Sue was also a prominent patient advocate for access to lenalidomide – a medicine prescribed for multiple myeloma – for the Cancer Alliance and FTPL. She spoke bravely and passionately of the struggles she face in accessing the medicine she needed at an affordable price, most memorably at the stakeholder meetings hosted by the Department of Trade and Industry on Intellectual Property Reform in October 2017 and at the Cancer Alliance launch of the Access to Medicine campaign in January 2018..
Sue was diagnosed with Breast Cancer in 2008 and with Multiple Myeloma in 2014. While she was initially able to access a generic lenalidomide treatment from India on a Section 21 authorisation from the Medicines Control Council at a price of about R5000 per month, this was revoked in 2016 when the originator product from Celgene, Revlimid, was registered in South Africa, at a cost of R882,000 per year. Sue’s medical insurer agreed to cover the increased cost of nearly R75,000 per month – but only for four months. After that, Sue and her family had to struggle to get the rest from their own pockets. Secondary patents will block more affordable generics from entering the South African market until at least 2028. This means that equitable access for patients like Sue is a long way off. Sue will be remembered by all for her bravery and unselfish desire to fight for equitable and affordable access for all – despite knowing that she might not be able to benefit from it. 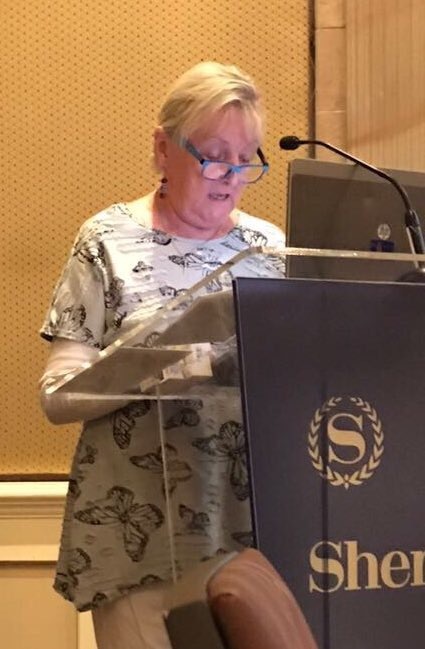 FTPL salutes Sue and will continue the fight for equitable and affordable access to lifesaving medicines for all in South Africa in her memory. With the FTPL and Cancer Alliance, Sue’s doctor, Dr Mike du Toit, appealed the MCC’s decision to deny the importation of generic lenalidomide into South Africa on the basis that the patented product was unaffordable and thereby inhibited access to patients in need of the life-saving medicine. In his appeal, Dr du Toit highlighted previous precedent of the MCC authorising the use of unregistered products on the basis of affordability concerns. The MCC’s 1 November 2017 decision to authorise importation of generic lenalidomide in response to Dr du Toit’s appeal ‘based on the previous use of the medicine and to allow for continuation of treatment’ further establishes precedent for the use of Section 21 to address affordability concerns. A recent report by the Cancer Alliance and Fix the Patent Laws demonstrated that many important cancer medicines remain inaccessible to the majority of people that could benefit from them in South Africa while under patent due to their excessive costs. The report further highlighted that South Africa commonly grants patents that are rejected, withdrawn or overturned in other countries – blocking access to more affordable generic products already available outside of the country. While Section 21 authorisations can improve access to generic products and should be applied more broadly for this use, the mechanism has limitations, including requiring detailed individual patient information, limiting patient numbers and, in some cases, dragging on for months or years through multiple appeal phases. The lenalidomide case therefore further highlights the urgent need for expedited, administrative compulsory license provisions to license the use of generic products in South Africa when patents inhibit access. On 6 November 2017, a group of US civil society organisations sent a letter urging the US government and industry not to interfere with South Africa’s efforts to promote access to lifesaving medicines. The group wrote they were “gravely concerned that the US government and industry representatives will try to undermine the South African government’s plan to reform patent laws over the next few months.” The letter notes that the draft intellectual property policy is both “consistent with South Africa’s international obligations” and “morally necessary.” It also highlights similar, existing policies in US law. The full text of the letter can be read below. PRETORIA – Today, more than 1,000 members of the Fix the Patent Laws Coalition (FTPL) will march to the Department of Trade and Industry (dti) in support of the government’s efforts to fix our patent laws and ensure everyone has access to the medicines they need. Made up of 36 patient groups and civil society organisations representing people affected by most major diseases in South Africa, the FTPL Coalition will hand over its in-depth submission in support of the draft Intellectual Property Policy, and a new report documenting the dire inaccessibility of many cancer medicines due to patent barriers. The draft policy was released by the dti in August 2017. The draft policy paves the way for a new, progressive intellectual property regime in South Africa, sixteen years after the signing of the Doha Declaration on Public Health – a critical international agreement confirming countries’ ability to amend their laws to incorporate public health safeguards. Notably, for the first time, the draft policy is clear in its prioritising people’s Constitutionally guaranteed right of access to healthcare services, stating that the final policy must “first and foremost engender the ethos of the South African Constitution”. “This reform process has been ongoing since 2009. We are encouraged that a final policy and actual changes to the law finally seem to be imminent. We march today to support the steps taken by the dti to protect public health, but also to remind the dti that people’s lives depend on the rapid conclusion of this law reform process. Until the relevant Acts are amended, people will continue to suffer and die in South Africa because they can’t access affordable medicines,” says Claire Waterhouse, Access Campaign Advocacy Adviser for Doctors Without Borders Southern Africa. The march comes almost a year after the tragic passing of prominent FTPL activist, Tobeka Daki – a mother of two fighting HER2+ breast cancer. Daki could not access the medicine she needed, trastuzumab, due to the exorbitant price tag of almost R500,000 per year charged by pharmaceutical corporation Roche because of a protected patent monopoly. The cancer medicines report launched today highlights that the case of trastuzumab is not unique. Of the 24 cancer medicines examined in the report, 15 are available in India for less than half of the price offered in the South African private sector. In the most extreme case, a year’s supply of lenalidomide is priced at R882,000 in South Africa compared to less than R32,000 in India. The report confirms earlier research showing that South Africa grants large numbers of secondary patents on medicines that are often rejected in other countries – a critical factor driving the vast price differences on the same medicines in South Africa and India. “Luckily, it seems that the dti has woken up to the fact that it’s time to put people’s health over pharmaceutical corporation profits. The cancer report indicates just how urgent this is, which is why we want to show our support for this draft IP policy. This is South Africa’s opportunity to be a global role model in this area and we are ready to push Parliament next year to make this a reality,” says Salomé Meyer of the Cancer Alliance. The submission of the Fix the Patent Laws campaign is available here. The timeline is available here. 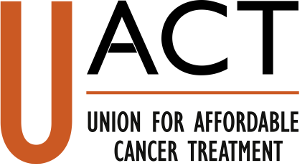 On October 10, 2017, the Union for Affordable Cancer Treatment (UACT) and 22 NGOs working on cancer in South Africa and members of the Cancer Alliance, submitted comments to the South Africa on the Draft South Africa IP Policy. The text of the submission can be read here and below. JOHANNESBURG, 14th AUGUST 2017 – On 8 August 2017, the Department of Trade and Industry published the Draft Intellectual Property Policy of the Republic of South Africa, Phase I, 2017. 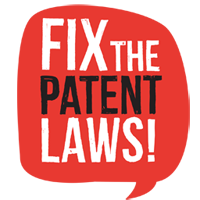 The Fix the Patent Laws Campaign (FTPL) welcomes its publication for public comment. The FTPL, a coalition of 34 patient advocacy groups, welcomes the clear statements concerning the critical importance of advancing the Constitutionally guaranteed right of access to healthcare services. The policy points the way towards ensuring everyone in South Africa can access the medicines they need. As pointed out in the draft policy, South Africa currently grants many poor quality patents that are rejected in both other developing countries and in developed countries such as the United States. The draft policy shows an encouraging awareness that it is ultimately people in need of medicines and the South African economy that pays the price for our free-for-all patent system. The draft policy states that the final policy must “first and foremost engender the ethos of the South African Constitution” and that a developmental and rights centred approach to IP is “urgently necessary”. We welcome the government’s commitments to cooperate to achieve the advancement of Constitutional rights and developmental goals and to do so urgently. The inter-departmental coordination between key departments, including Trade and Industry (DTI), Health, Economic Development, International Relations and Cooperation, Science and Technology and Higher Education and Training will be critical to achieving these goals as multiple departments are responsible for the legislation in need of reform. The FTPL will hold all government stakeholders to these commitments. The draft policy identifies public health as a priority on the basis of important public interest considerations. It indicates that the DTI, together with key government departments, intends to address substantively in the immediate term, access to medicines, vaccines and diagnostics and South Africa’s approach to international IP cooperation. This policy and law reform process could thus be an important constitutional measure “to achieve the progressive realisation” of the right to health. We welcome the DTI’s engagement with the United Nations Secretary General’s High-Level Panel on Access to Medicines report, which makes important recommendations about what states can do to ensure greater access to medicines, particularly through patent law reform. We thank the DTI for taking account of the submissions made in respect of the IP Consultative Framework and for the substantive detail contained in this draft policy. The FTPL will study the draft policy and make comprehensive comments to assist the DTI and its government partners to implement the reforms in line with their constitutional obligations. We support the implementation of a system of substantive search and examination of patent applications in order to ensure compliance with existing law and to ensure that only applications deserving of patent protection are granted. We agree with the proposed incremental approach, which we submit can be achieved by starting with the pharmaceutical sector and by considering outsourcing of the examination of applications for patents. We support the recommendation to introduce pre- and post-grant opposition procedures in our law. We agree that such procedures are beneficial in that they ensure that the patent examiner has access to relevant information concerning the patent application. Third parties, which could include generic companies and civil society groups, will be able to assist the patent examiner in the decision-making process. We encourage an administratively cost-effective procedure and wide access to information concerning patent applications to enable third parties to intervene. We will make detailed submissions on potential interim procedures to enable such interventions as early as possible. We welcome the commitment to develop patentability criteria in line with the state’s “constitutional obligations, developmental goals and public policy priorities” as well as the intention to utilise available flexibilities to strike the correct balance between promoting innovation and protecting the rights of IP holders and users (patients). We hope that this stated intention will lead to fewer poor quality or ever-greening patents being granted in South Africa and that instead only true innovations will be rewarded with patent protection. We support the recommendations to introduce non-judicial, cost effective and expeditious mechanisms to obtain medicines through the issuance of compulsory licences. In this regard, we support the recommendation to remove the requirement that a government department first negotiate terms of a licence before approaching a court to seek a compulsory licence. This is not required by the TRIPS Agreement and should be removed through the necessary amendments to the Patents Act. Unlike countries like Argentina, Brazil and India, South Africa has to date not taken sufficient advantage of the public health flexibilities available to it in international law in order to promote public health. This draft policy provides an opportunity that should not be squandered. It has taken 20 years of stalled policy processes to get to this point. If South Africa wishes to lead on this issue, as is expressed in the policy, the policy must be finalised with the necessary urgency and draft bills must be published with equal urgency so that the people can directly benefit from greater access to medicines for cancer, tuberculosis, HIV, mental health conditions, hepatitis, epilepsy, and many other diseases. Many people in South Africa continue to die and suffer because they cannot access the medicines that they need. This policy provides hope to those people. It is now up to government to deliver on this promise by swiftly implementing wide-ranging law reform in line with this policy. The FTPL will publicly share its submission and its full views on the draft policy. We encourage other stakeholders to publicly state their positions on the proposals in the draft policy. Comments are open for 60 days from the date of publication of the draft policy in the Government Gazette. The Fix the Patent Laws is a joint coalition of 34 patient groups, including: Advocates for Breast Cancer, AmaBele Belles’ Project Flamingo, Breast Course 4 Nurses, Breast Health Foundation, Cancer Alliance, Cancer Association of South Africa (CANSA), Can-Sir, CanSurvive Cancer Support, Cape Mental Health (CMH), Care for Cancer Foundation, Childhood Cancer Foundation of South Africa (CHOC), Community Technology Enablement and Collateral Harnessing (Community TECH), DiabetesSA, Doctors without Borders (MSF), EpilepsySA, Hospice Palliative Care Association (HPCA), Igazi Foundation, Look Good Feel Better, Marie Stopes South Africa, Movember, National Council Against Smoking, Oncology Nursing Association of SA, Pancreatic Cancer Network of SA, People Living With Cancer (PLWC), Pink Trees, Pocket Cancer Support, Reach for Recovery, Schizophrenia and Bipolar Disorders Alliance (SABDA), SECTION27, South African Depression and Anxiety Group (SADAG), South African Federation of Mental Health (SAFMH), South African Non-Communicable Diseases Alliance (SANCD Alliance), South African Oncology Social Workers Forum (SAOSWF), Stop Stock Outs Project (SSP), The Sunflower Fund, Treatment Action Campaign, Vrede Foundation, and Wings of Hope.